When strawberries are in season, this strawberry freezer jam is a MUST make! Super simple and so tasty! When strawberries come into season, it doesn’t seem to last long. Sure, you can get fresh strawberries at the grocery store all year round, but when they are not local, and in season, they can taste “off”. That bland flavor isn’t very appealing to many, right? Taking advantage of the May through June strawberry season is important when you want to get the freshest, ripest, best tasting berries you can. It’s really the only way you can fully enjoy their sweet, juicy, flavor. Strawberries have so many health benefits. They are loaded with Vitamin C, anti-oxidants, and are very low on the glycemic index. The fiber and potassium are also great for overall heart health. All of this, with only 49 calories, 8.7 net carbs in one cup! Is it any wonder that strawberries are a very popular fruit? To see over 45 more delicious ways to use strawberries, read the post here. Begin with 2 quarts of fresh strawberries. This will make approximately 4 cups crushed berries. 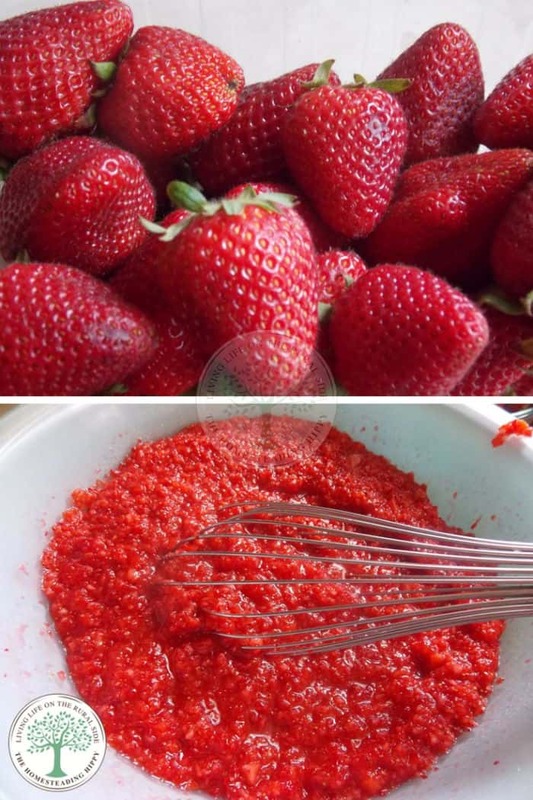 Gently mash the strawberries with a fork or potato masher. Using a blender or food processor also works really well and is much faster. In a separate large bowl, mix together 2/3 cup sugar and 2 Tablespoons pectin very well. Add in the crushed strawberries and mix together for 3 full minutes, stirring constantly. Carefully pour into clean pint jars. I like the ball freezer jars, but any freezer capable jar is fine. I’ve reused old jelly jars for this, old spaghetti sauce jars, whatever. For the most part, it’s not going to be in the freezer for longer than a couple months anyway. Freeze for up to a year, or put in the fridge and enjoy within 3 weeks! For keto, or low carb, use the low sugar pectin and add stevia or erythritol instead of table sugar. 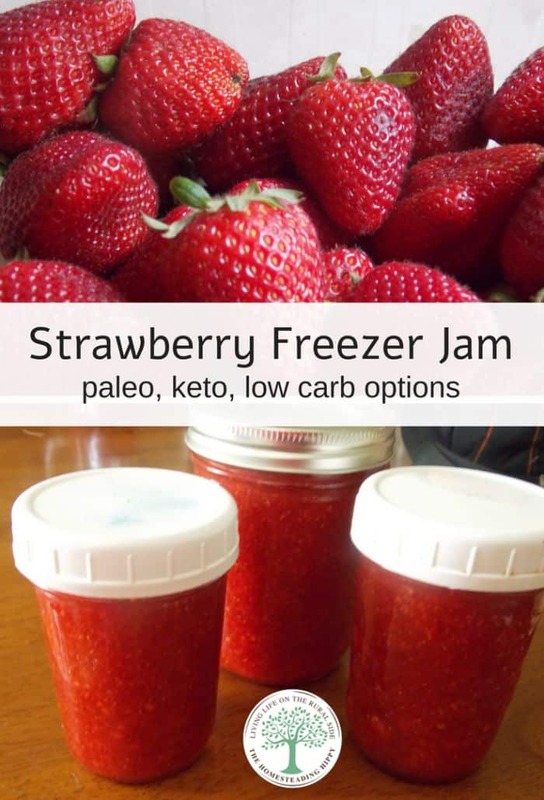 Do you make strawberry freezer jam? Are you going to try it next time you have strawberries? would love to know if this will work with other fruits? would the ratio for sugar and pectin be the same with others? yes, the ratio woudl work with other fruits…if you use peaches though, you will want to add 2 teaspoons lemon juice to the peaches before adding to the sugar and pectin mixture! How much does this make? I just bought a pound of fresh strawberries a few days ago so I may just try this. Freezer jam is so much less work then canning! I actually use less sugar. Do you use low or no sugar pectin? Sounds delicious and easy! I have to do this to stretch our strawberries. The kids polish them off as soon as I get them home. I don’t think I’ve told you today how much I love your blog =) I’m looking to get into freezing more homemade stuff this growing/harvest season so thank! My husband’s favorite is strawberry jam so I will definitely be trying this. One question though, I have never frozen anything in glass jars because I’m afraid of them breaking. Do you have any tips on how to avoid this? I honestly have never had anything break from freezing in a glass jar…but to be on the safe side, try using only the jars that are “canning” for that purpose. Also, be sure to leave some headspace room for expansion during freezing. I love strawberry jam! And it looks so easy to. That’s it!? Last year a friend, hubby, and I made strawberry jam but I promise you it was not this easy! Can I substitute the strawberries for raspberries or other fruit? Generally I’m not much for cooking type stuff, but I think I could do this. Would much rather feed my kids this than stuff from the store! Well that sure looks easy and delicious! This takes me back. Back to my childhood and my mamaw’s kitchen. What sweet memories! Thanks. I LOVE Strawberry Jam! Thanks for sharing this recipe, I will have to give this one a try! Sounds So Yummy I Will Love This! This looks great and so easy! Can’t wait to pick strawberries this summer then try this out! It looks so easy to do. I love strawberry jam. Yum….now I want to finish some fresh strawberries so I can make some too! I’m been a few years since I’ve been able to get a good deal (my strawberry bed died 🙁 ) So hopefully I’ll get lucky this year! 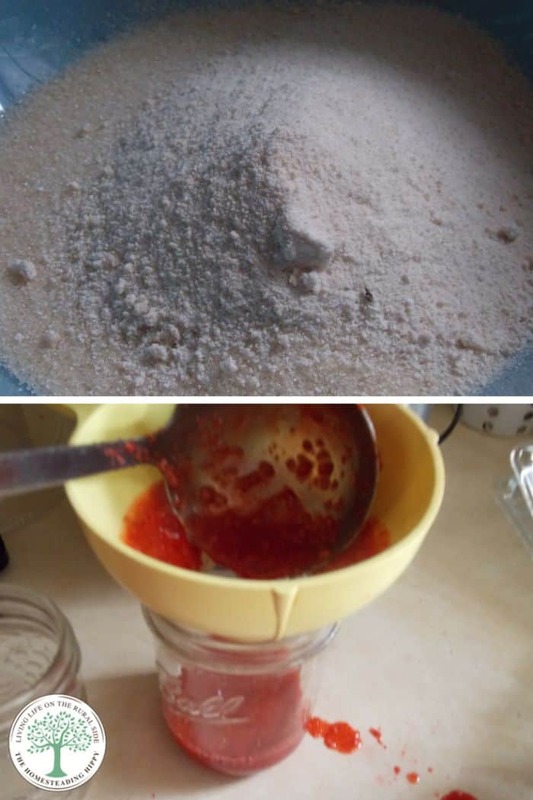 I had no idea making jam was this simple! This would go so well with my homemade yogurt. Right now I’m able to get a great deal on strawberries so this will save me from spending money on preserves. Could you take it a step further and process this in a canner and keep it in a pantry? This recipe is soley for freezer jam. there are other ways to can it for pantry use, though.